This game was everything for me. I liked the original Legend of Zelda, but A Link to the Past was the game in the franchise that made me a die hard fan. A fan for life. The same thing that Ocarina of Time did for gamer a generation later, that is what this game did for me.This was the first game to ever have me pull an all nighter. I cant remember exactly how old I was then, six or seven? Whatever age I was I was completely captivated by this game. It had it all. Drama? Check Action? Check. Suspense? Check. 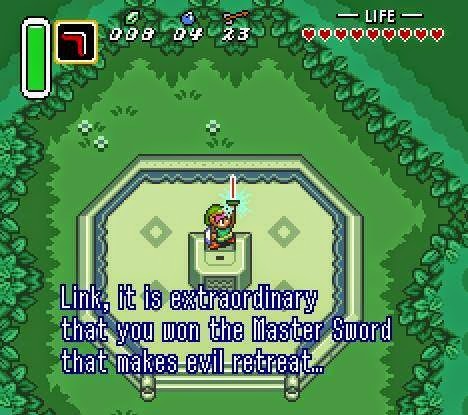 I still remember the sad moment when Link’s uncle gives him the sword in the first dungeon of the game before passing away shortly after. 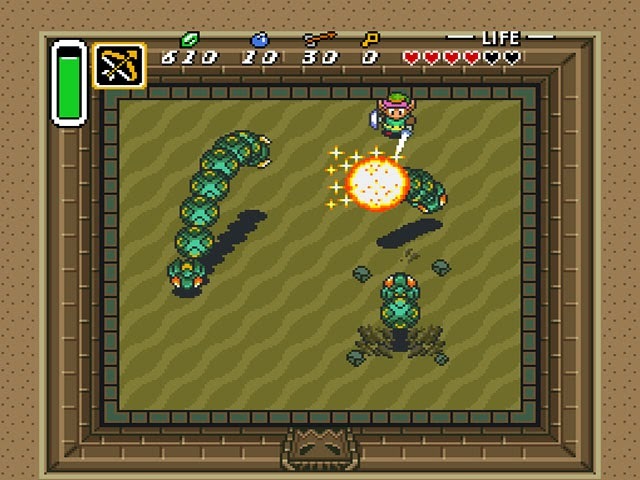 Or how about the horrible scene of Agahnim the evil Wizard sacrificing Princess Zelda by sending her to the Dark World? For a game with very little dialogue, it was still able to convey tons of emotion and character. This is one of the prime examples of why the franchise does not need Link to have a voice. Much can be said by not saying anything. Lets not forget this game was released back in 1991, but back then this game was massive. It felt like ages going from one side of the world to the other, and I loved it. The sheer scope was breathtaking and there was nothing like it back then. It was like nothing else I had ever seen or played before. With so much to see and do, it felt like I could spend countless hour just walking around hitting random walls looking for fairy fountains. Wait… that’s something I actually did. Not only was the games world huge for its time, there was also so much to explore and do. From secret passages to hidden items, the game rewarded you for your exploration. One thing that remains constant throughout the franchise is the art style, and when I say constant I mean constantly beautiful. Even ALTTP, for how old it is, is still a very nice looking game, and is much easier to look at then say Final Fantasy 7(which although great, has not aged well graphically). Different art styles age much better than others, and this games colorful 2d world is a perfect example of such. Going back to the point of there being so much to see and do, much of this can be credited to the game aesthetic. The Legend of Zelda series has never been a slouch in design, and this game can be given credit for bringing to life some of the series most iconic creatures and locales. It takes more than just a pretty game to make a great game though, and this brings me to the topic of music. 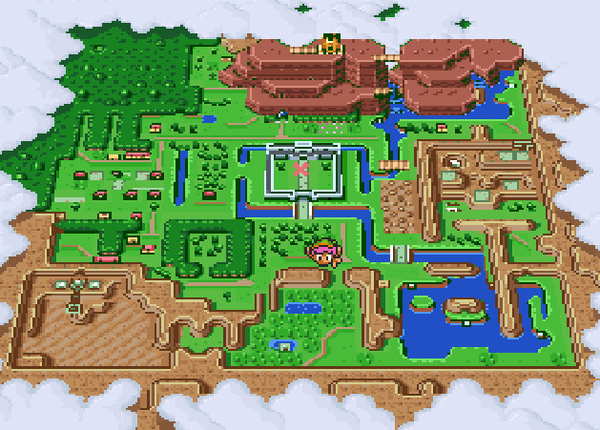 There is arguably no other song as iconic in the world of video games as the Legend of Zelda Overworld theme. Just that song in itself would be enough, but the game(s) has so many different memorable tunes, its hard not to appreciate them. Some melodies are softer and slower, then other are faster and more menacing each conveying different emotion for different situations throughout the game. We have already covered the looks and sound, now on to playability and replayability. This is one of the most important features that makes this such a timeless classic. The fact that every Zelda game plays so smooth and beautifully is a credit to the pedigree of Nintendo as a developer. Just like with any Mario game, you can rest assured anything in this series wont be less than spectacular. The game is extremely easy to pick up and play, but don’t let that fool you into believing the game is not challenging. The streamline control scheme in my opinion allows the gamer to focus on whats important in the game, exploration. The game is full of dungeons and forest both packed puzzles and traps. Its up to us as gamers to utilize the weapons and items we find while exploring to get past each of them. The Legend of Zelda A Link to the Past is my ruler for measuring the greatness of any game. I know that is setting the bar high, but if you don’t reach for greatness why even try? There have only been a few games that have entertained me as much or for as long as this single game has. From the moment I picked up my sword and shield and set of to save the princess and the land Hyrule, I knew I was in for an awesome ride.This game is was amazing back then and has stood the test of time, and is seen by many as one of the greatest video games ever made. Never in my wildest dreams did I ever imagine that this game would change my fondness of video games into the love it is today. It’s one of the true Nintendo Treasures. I’m glad it has a true sequel now too with A Link Between Worlds. Ancient Stone Tablets and Four Swords never really felt like a proper one.